IN the 18th century ships were often lost at sea as they did not have the means to measure longitude. Two men, separated by 200 years, spent their lifetime trying to save ships from the fury of nature. Longitude on the History Channel on Sunday at 8.30 pm tells the story of these two geniuses. 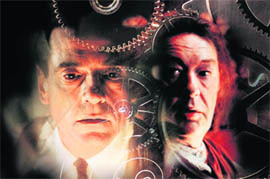 The first is an 18th- century English clockmaker John Harrison (played by Michael Gambon), who spent 40 years in inventing the chronometer that could accurately establish the longitude at sea. Over two centuries later a British naval officer Rupert Gould (played by Jeremy Irons) chanced upon Harrison’s chronometer and perfected it. Driven by Irons’ and Gambon’s masterful performances, Longitude is a kaleidoscopic saga of discovery and determination that resonates long after the credits roll.